It’s truly fabulous when seasons collide as you manage to get the best of both worlds. 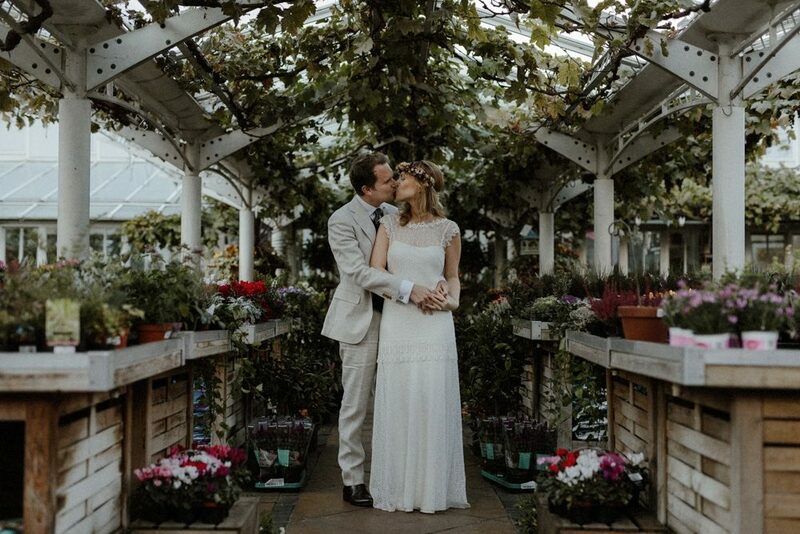 In this case Sophie & Arjen managed to have a beautiful greenhouse wedding at Clifton Nurseries in London in September, with lots of late Summer, early Autumnal vibes and colours, mixed with a fresh botanical setting. 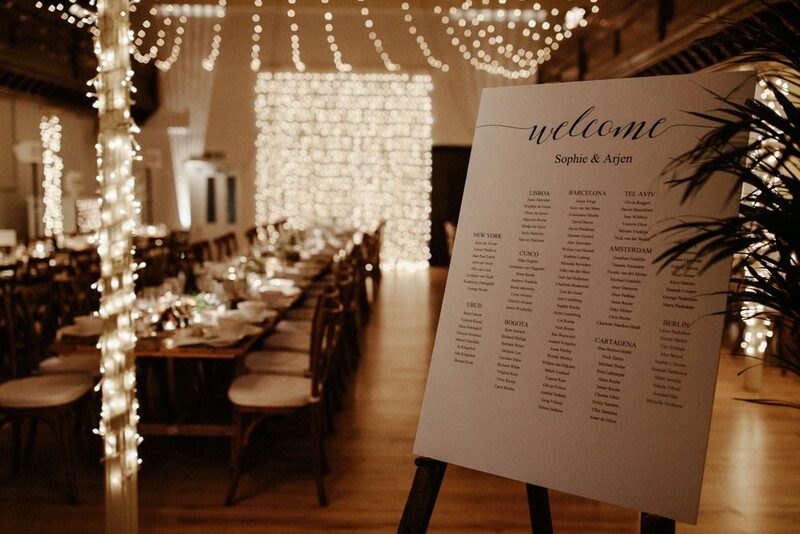 The results are incredible, and Olivia & Dan Photography‘s style was perfect for this relaxed, but enriched setting. Making everything even more perfect are the fashion choices. 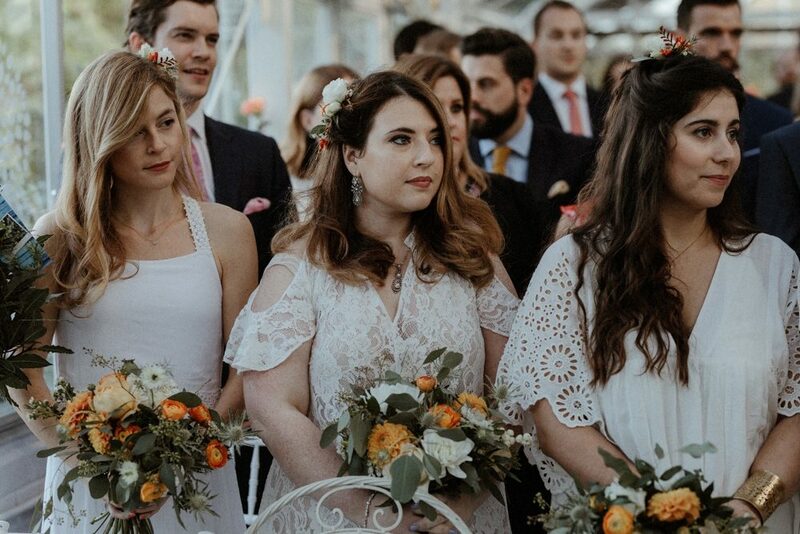 Bride Sophie looks exquisite in a Sally Lacock lace gown, and the bridesmaids fierce in white dresses to suit their personal taste. Sophie the Bride: I realised I loved the aesthetic of Parisian designers such as Delphine Manivet, and so wanted something along those veins. I liked the idea of an understated dress, yet with delicate artistry, and so after searching for a similar designer in London, I came across Sally Lacock. I loved the vintage 1920s vibe of her dresses, and actually ended up going to her house as she was taking a sabbatical. She only had a few dresses left and my dress ended up being the second or third dress that I tried on! It was a style which I wasn’t used to wearing, so it felt special but still simple and effortless. It had a dropped hem waist with some fringing and a low back. The intricate detailing was just what I was looking for, as it elevated the whole look, but in a subtle way. I really loved the experience of meeting the designer herself, you could tell how important and personal her work is to her, she really takes an interest in who her customer is which was refreshing. My flower crown was also by Sally Lacock, and I tried that on during the fitting, and it just went perfectly with the dress. I wore my hair down as I wanted a relaxed look, and to feel like myself. As the dress was quite long, my shoes weren’t the focus of attention, but i did want a touch of sparkle to peek out, and so opted for a pair of classic silver court shoes from Kurt Geiger. Arjen didn’t want a traditional English wedding suit, and definitely nothing too formal like a tux. He really wanted something more casual and ended up going for a light coloured semi-bespoke suit from Suit Supply in Groningen . He left it a little late to actually purchase the suit, and was a little horrified to learn that there were only two left in the world, when he went back to buy it. luckily one was at the warehouse in The Netherlands where he had travelled back to purchase it, and he managed to get it sent to the shop and it fit! His shoes were from Hawes & Curtis , and he wore a printed blue tie from Hermes and cufflinks from Etsy. Clifton Nurseries is just so beautiful, and right behind where I grew up so it felt like there was a real connection with it. 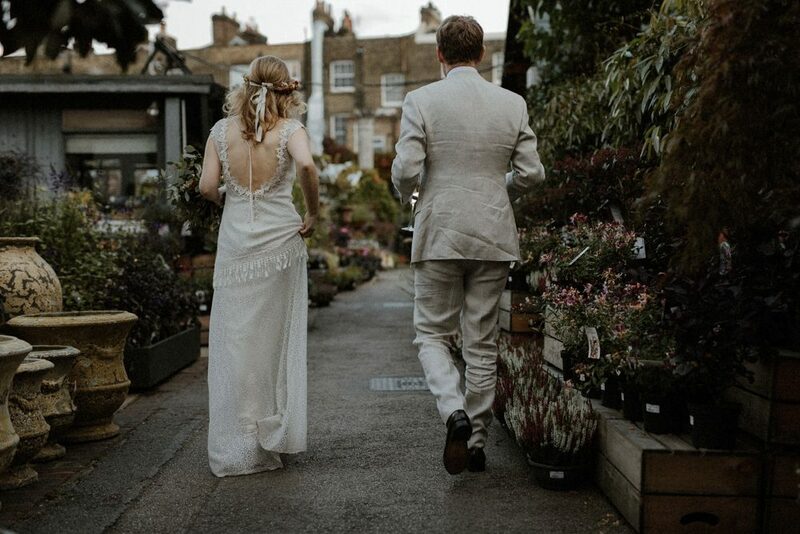 We wanted somewhere that was very ‘London’ and loved the back-drop of the city, as well as the personal and intimate setting. They only do a very limited number of weddings a year, which made it feel exclusive too. Little Venice is also a really lovely area full of picturesque canals which we thought Arjen’s family travelling from The Netherlands would appreciate! The reception dinner was held at The Amadeus centre just a 5 minute walk away. We had attended a few parties there before, and loved how it was just a total blank canvas that we could decorate to our liking. 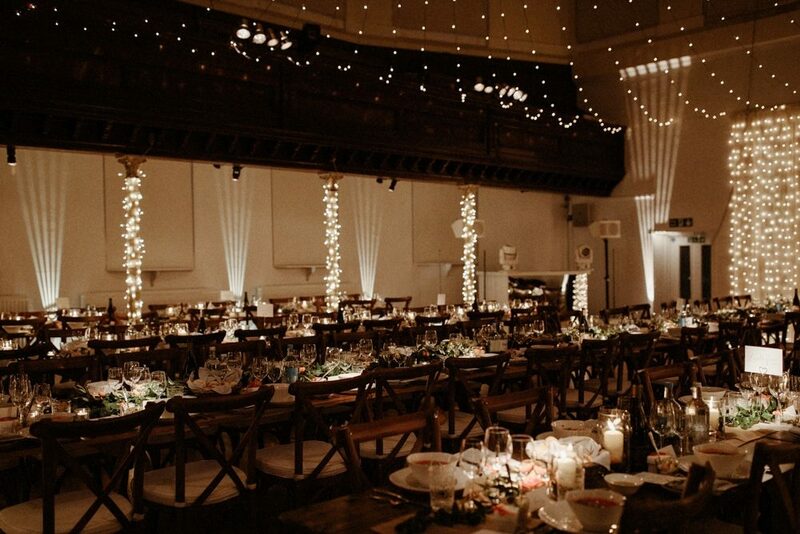 We wanted the place to feel warm and inviting, so transformed it with hundreds of fairy lights which were done by Red Cat Lighting and a huge glitter ball! 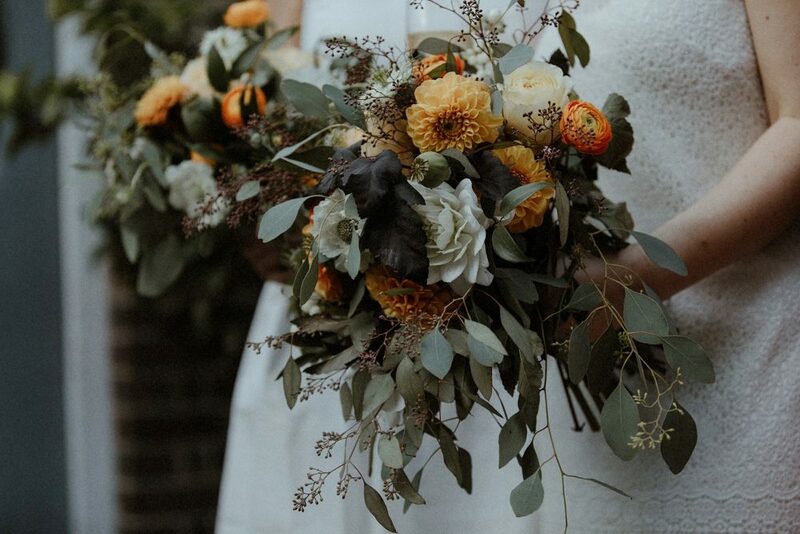 We got married in September, and I really liked the idea of bringing burnt orange into the colour scheme as it felt autumnal, and so we introduced orange accents throughout, mixed with green and white. A lot of the houses surrounding Clifton Nurseries are either London brick or painted white and I loved the way the colour scheme of the flowers worked so well with this backdrop. The venue itself didn’t need too much decorating as it’s already beautiful enough, so we just put some additional touches in the ceremony space like decor on the chairs. We got married under a traditional Chuppah to give a nod to my Jewish heritage which was also decorated with pretty floral elements. The florist was Pushkin Cambridge from Violet & Frederick. I explained that I wanted something organic, deconstructed and a bit messy, and she just totally got it. When the bouquets turned up I just thought she’s nailed it! For the reception dinner, we wanted minimal, rustic decor and so had a runner of greenery peppered with orange flowers and quinces (which were a reference to The Quince Tree Cafe which is where we got married in Clifton Nurseries). My mum organised much of the dressing and spent a lot of time leading up to the day organising it all. We had our menus designed by calligrapher Judy Broad as we wanted these to be a feature of the table decor. The favours were in a little white box, tied with orange ribbon. The bridesmaids all wore white and chose their own dresses. I didn’t want everyone to have a uniform, and liked how the white tied in with all the white houses surrounding the nursery. I wanted a clean look and it turned out beautifully! The groomsmen all wore dark blue suits from Suit Supply to contrast with Arjen’s lighter outfit. We opted for a late 5pm ceremony which was short and simple, it felt like it happened so quickly! 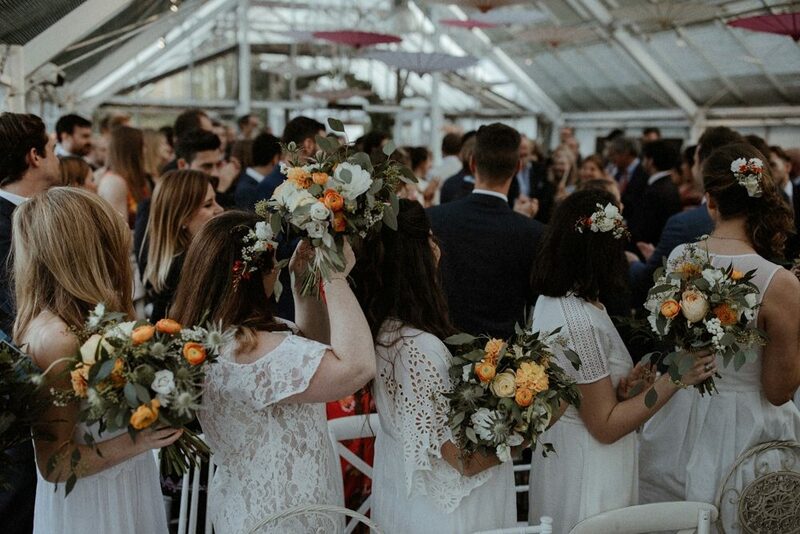 A memorable moment was when the music on Spotify stopped quite abruptly with a few technical sounding crackles as I had just reached the end of the aisle – it seemed to break the ice as it was all bit nerve racking but this made everyone laugh and we relaxed a bit! A friend also read a poem about Barcelona which is where we met, and it was a lovely sentimental touch. We hired a DJ from a company called Wedding Smashers for the party afterwards and incorporated some traditional Jewish dancing into the mix, it was so fun and was a great way to get everyone onto the dance floor. When I look back at the photos it’s great to see the mix of people dancing together and having a good time! The food was one of the most important things for us, we wanted it to be a part of the whole colour/decor scheme, and also taste great. The caterer is Venezuelan and her company is called Mango Bajito. She had previously catered functions for family members and the food was amazing! We wanted lots of bowl food, which was fun, colourful, and less formal. Arjen and I love to travel and so incorporated cuisine from all around the world to reflect this as much as possible. We wanted fresh, vibrant, food that was presented beautifully, and think the caterer did an amazing job! Olivia & Dan were our photographers, and had been recommended by a friend. We started following them on Facebook and Instagram and just fell in love with their moody artistic style. Their photos really convey a sense of emotion and feeling, and needless to say turned out amazingly. We couldn’t have hoped for more beautiful pictures, and we’ve had so many compliments from friends and family on them. They really captured the magic of the day!